While you’re busy browsing for inspiration for your wedding, it can be easy to just focus on bouquet and décor color when it comes to flowers. But did you know that many blooms also have a hidden meaning or association? For a fun and meaningful touch to your wedding, think about your theme and what you want your day to convey, then look at floral options that fit well with this. Roses are definitely one of the flower types that people traditionally associate with beauty, love, romance and, of course, weddings! Available in a huge array of colors, types and scents – there are over three thousand varieties of rose grown commercially! Tea roses, garden roses and spray roses tend to be the most popular for weddings. Depending on the color, roses have different symbolic meaning. A red rose symbolizes passion whereas a white rose means purity. Pink signifies joy and admiration whilst orange symbolizes desire and enthusiasm. So if you’re looking to incorporate meaning and a personal touch into your wedding and want to use roses, make sure you think about the color and how this fits in with your theme. One of the most popular flowers at the moment are dahlias, a bloom which continues to dominate late summer and fall wedding designs especially as September and October are some of the best times to buy them. They have large blooms, are a symmetrical shape and are more affordable than other popular wedding alternatives (peonies, we’re looking at you here). Related to daisies, dahlias are originally from Scandinavia – their name translates to “from the valley” which works really well with an outdoors or garden theme. You could also co-ordinate your bridesmaid’s robes to your flowers with this beautiful Dahlia Print Floral Robe, ensuring that your theme runs throughout the day. This traditional bloom is slowly becoming more popular again, with its abundance of petals close together and pastel tones. Hydrangeas are also traditionally associated with perseverance and heartfelt emotion, which makes them a great choice for a symbolic wedding flower. With their dark, waxy leaves and large, delicate flowers this South African plan comes also comes in a miniature variety. You often see gardenias as a focal point in bouquet or used in table decorations or in the brides hair. They symbolize joy and are perfect addition to a personal, fun wedding day. A popular wedding choice, this elegant, trumpet shaped flower has very high brow meaning behind it – it’s meaning is ‘regal’, making it perfect for fairytale or more formal weddings. 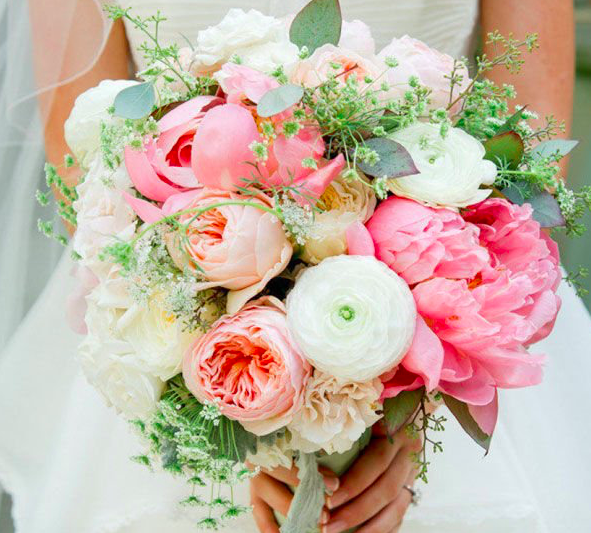 If you’ve done any Pinterest research for your wedding, you’ll probably have come across a plethora of peony bouquets. Available in a variety of color and styles, they can be expensive – particularly if you want them outside of their summer season – but did you know that they actually symbolize a happy marriage? Just another reason why they’ve been an extremely popular bouquet choice in recent years! Whatever color peony you go for, you can always match your wedding robes with your flowers, so that the photos of you getting ready will tie in with the photos of you with your bouquet – try this pretty Peony Print Floral Robe. For a really cute touch, you could always match other aspects of your wedding to your flowers such as your invitations, bridesmaids floral robes or your bachelorette party. The post What Do Your Wedding Flowers Mean? appeared first on The Paisley Box. There might be something wrong with your blog. It seems to repeat and some images are missing. The ones that are there are glorious. So much to think about. I am glad I opted for a destination wedding so they wedding bouquet was provided! Hi Lisa I replied to this the other day but I guess all of the updates to the blog site caused it not to post and it was also effecting some of the images appearing in the posts. Destination weddings are fabulous. I have planned quite a few.